While the real riders made their way along Highway I-40 towards Gallup in New Mexico, I spent the day in the Painted Desert and Petrified Forest National Park. First of all, I rode the upper loop, stopping to take photos along the way, then drove down to Blue Mesa where I made a number of fascinating discoveries. That the world is really quite small was brought home when a young man on a bicycle that seemed to be loaded down with his whole household began a conversation with me. And so I met Stefan Schlup from Basel, Switzerland. He was on his way from Miami to San Francisco, and was delighted to be able to converse in Swiss German, for a change. The most amazing coincidence, we discovered, is that we will be flying back to Switzerland on the same day, with the same airline, at the same time! Whereas most of the Painted Desert seems to be held in various shades of orange and magenta, the Blue Mesa is a composition in blue and grey. The earth there is quite porous and rain and weather have worn the area into complex patterns. The layers of sediment are quite clear and easily observed from the valley floor, reached by a steep path. A small loop with explanatory signs provides excellent information about the geology and history of the mesa. After visiting this wonderful park, it was time to get back on the road and catch up with the riders. I am always amazed at the enormous distances (93 mi/148 km) they are able to cover in just a few hours, and this despite gusty side winds and numerous flat tires. 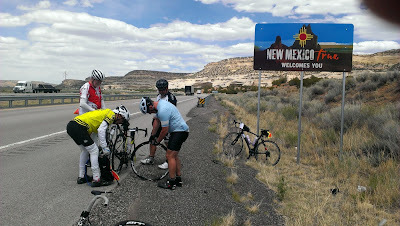 Emil has found a good team to ride with and they help each other out. After dinner we met to say good-bye to Bob, who was leaving the ride in order to attend a traditional family get-together, and to congratulate Navi on having passed her exams to medical school. Everyone enjoyed a piece of cake, and then it was, as usual, off to bed for a good night's sleep.